I was super excited for March's Birchbox to arrive mainly because of the Benefit treat inside the box but also because the box design. 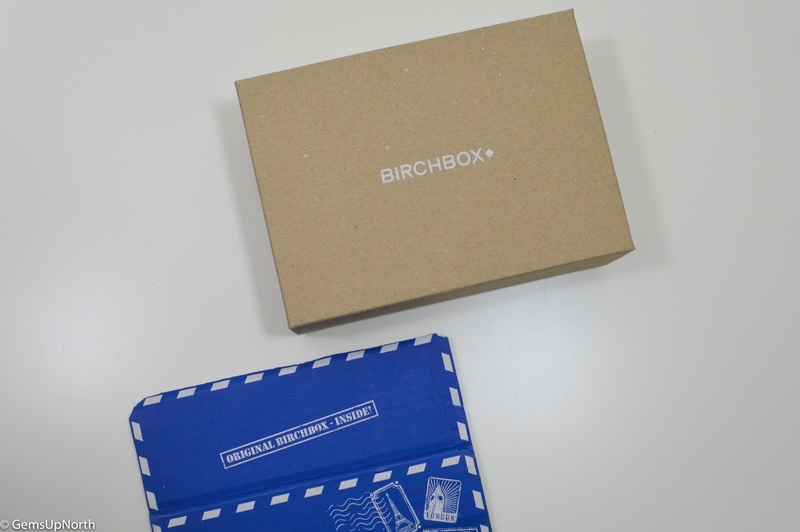 Birchbox has brought back the original box design for this month to celebrate 6 years of Birchbox, Happy Birchday guys! 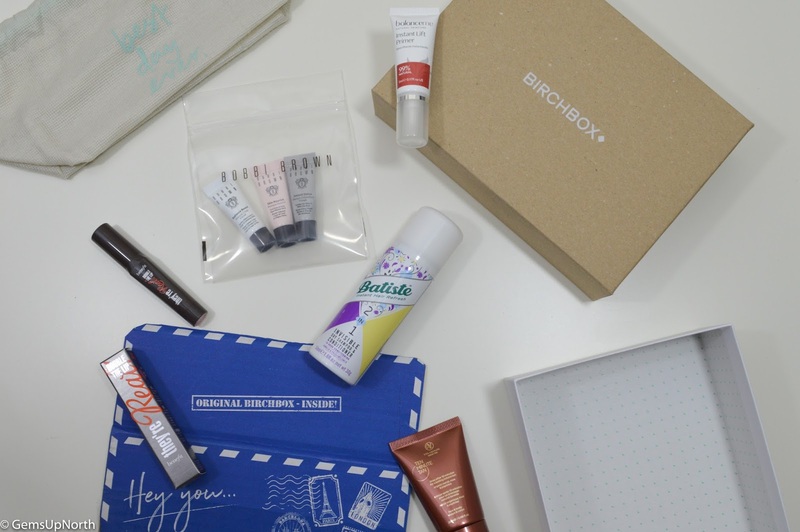 I've been subscribed to Birchbox for a year and a half now and it's still my favourite subscription; even if I don't like each and every item in the box there's usually a few items or even the box design that keeps me happy. The design of the March box has gone back to its roots like I've said above with a plain brown lid and white box but still with the Birchbox name printed on the top. I like the simple design but I've grown fond of the drawer box designs we have all been receiving lately and I hope that the drawer box is back next month. Inside this months box was 5 items, none of which are full size but I'm really impressed with the brand selection and that most of the products are suited to me. There's only one item I haven't used in the box and that's the Vita Liberata Ten Minute Tan; this is only because I don't use fake tan so I won't be reviewing this item. 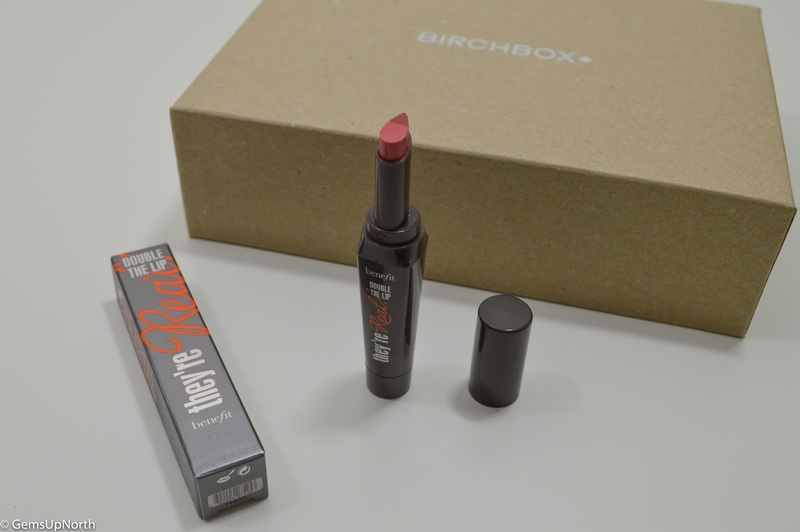 Each month subscribers are now able to choose an aspect of their box and this month it was a shade choice of two Benefit lipsticks; either Lusty Rose or Pink Thrills. I went with the Lusty Rose shade because I already had the other shade from receiving it in a set at Christmas. I'm really happy with my shade choice because it's a nice pinkish shade that I can wear everyday. These Benefit Double the Lip are a 2 in 1 product with lipstick and lip liner in one meaning only one application and less products. The pointed end of the lipstick has the liner as you can see with the darker shade; this enhances my lips when I wear the lipstick. 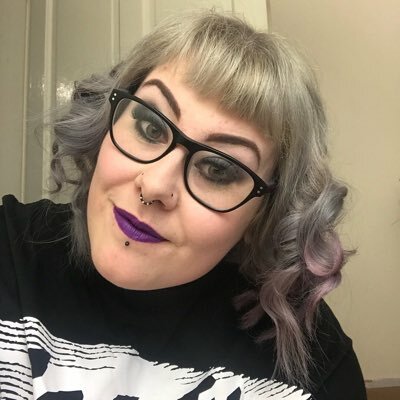 I've found that a couple of sweeps across my lips gives me enough coverage and the lipstick lasts a good few hours too. Batiste is one of my favourite hair care brands and I use dry shampoo very regularly, I have already purchased a full size can of this Invisible Dry Shampoo and Conditioner but I was happy to find a travel sized extra in my Birchbox this month; I can pop this in my bag now. The scent is my favourite too being Vanilla & Passionflower, as all my readers know by now I love anything with a Vanilla scent. I've found that this 2 in 1 conditions my hair more than dry shampoos because my hair feels super soft after using this but I feel I still need my Batiste dry shampoo on none hair washing days. Still a big fan of this product though for but more for the conditioning element. I first tried Bobbi Brown through Birchbox back in December, I received a mascara then and was really impressed with the brand. 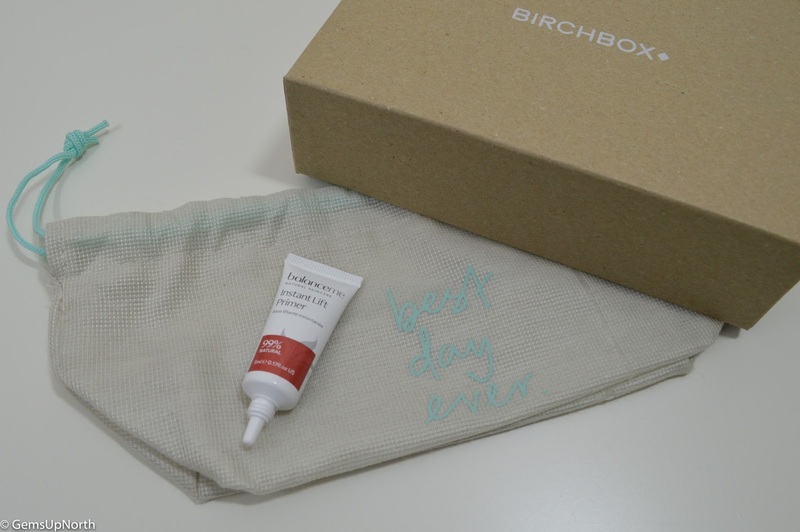 This month Birchbox added the cutest ever mini samples of Bobbi Browns facial masks. Having all three samples meant I was able to find the best mask to suit my skin type; in the mini kit was, Radiance Boost, Instant Detox and Skin Nourish. Although there wasn't enough product to apply all over my face in each tube I was able to apply the masks to different areas on my face, like on my t-zone I used the Detox mask and on my dry areas I used the Skin Nourish. Now if I was to purchase a full size tube of any of these masks I would have to fork out £33.00 and for a face mask I find that too expensive for my budget but I've fully enjoyed sampling the masks and my second product from Bobbi Brown. Birchbox told us about this product in the sneak peeks earlier in the month and to be honest I wasn't that excited about it; another primer I thought but I was pleasantly surprised. The last time I received a Balance Me product I had the same feeling but was impressed after using the product. This Instant Lift Primer is 99% natural, complexion perfecting, skin smoothing and instantly lifts and refines your skin according to the product information. I've found that after applying the primer my skin felt and looked plumped and smooth. I was able to apply my base makeup effortlessly and I actually used less foundation when wearing this primer. I have to say I am impressed but I have one little niggle and that's the scent is a little over powering for a primer. Birchbox have put together a good box this month minus the fake tan, I think there should an option on the profile survey to say weather you wear tan or not so you don't receive products you can't use. The original box design was great to receive to see what the first boxes looked like but I really hope the drawer design is back in April. You can grab £5.00 off your first box then use my referral link here and don't forget that each month you get to pick something so this could be the box design or a product inside. I love this added feature that Birchbox introduced in February.